This time round, I had the opportunity to handle this limited edition Mini Monster from Thailand. It is based on a regular Seiko 5 Sports model that was nicknamed “Mini Monster” by Seiko fans due to its similarity to the Seiko Monster. Here’s an earlier post that shows several variants of the Monster including the limited edition ones from Thailand. And below is a picture of a regular Mini Monster, SNZF47J that I used to own as well as some notes that I wrote when I posted about the watch in December 2008. Watch measures 44mm across including crown and lug width is 22mm. The bracelet fits directly into the lug without the use of end pieces. The shape of the lug is designed such that there is no gap between the bracelet and the watch as you can see in the picture. Because of this design, I was unable to put the watch on a Z22 strap because there isn’t enough room to accommodate the strap. In fact, the gap between the spring bar and the watch is so thin that it can’t accommodate a Zulu strap. I guess the only strap options available to this watch are the thin NATO and the standard leather straps. I ended up using the metal bracelet. Note that there is also an all black regular edition so the blackened case and bracelet here ain’t something extra. The watch comes in a pouch as shown below. From what I understand, there should be a rubber strap included in the package but for some reason it wasn’t there. This is a used watch and the strap could have been damaged or simply kept by the previous owner. From the warranty card, it can be seen that the watch is limited to 1881 pieces. 1881 was the year in which Hattori & Co. Ltd, the predecessor of Seiko Corporation was established. The date of purchase shown on the warranty card is 24-3-53. This is based on the Thai Solar Calendar whereby 2010 is converted to 2553. I believe the day and month are the same on both calendars. The crystal on the caseback is printed with “Top Sapphire Crystal”. You can also see the serial number – 9D1656 inscribed on the metal part of the caseback. 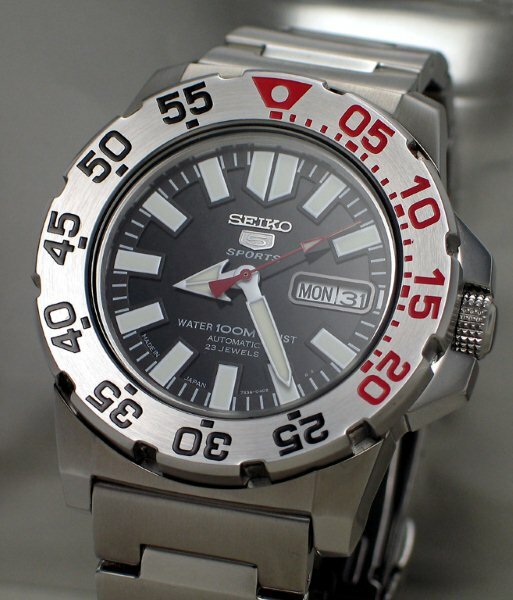 Using Seiko’s convention, “9D” may indicate that the watch was made in December 2009. The limited edition Monsters from Thailand are probably some of the most expensive watches that are powered by the 7S movement in terms of resale value. The limited edition Mini Monsters will probably fetch a good price but won’t be anywhere close to the prices of the LE Monsters because 100m models usually do not get much attention from collectors and 1881 pieces is a large quantity for a 100m Seiko 5 Sports model. You have to register in registration form and send by mail/e-mail (I don’t see that form in your pouch) … then Seiko(Thailand) will send you a rubber strap. BTW it also have blue(Turquoise) color which made for 999models that more interesting. Thanks for the info. I guess the previous owner did not register.